It's that time of year where friends and family gather for holiday parties. Every year, one of my good friends holds a White Elephant party and we all get together and exchange goofy gifts and then afterwards we enjoy snacks and play fun games. 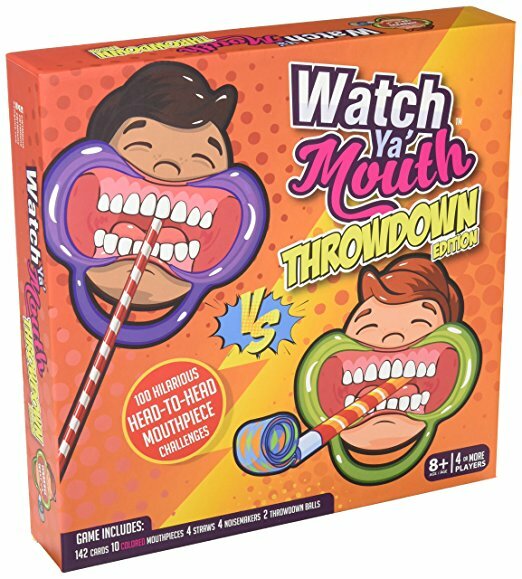 Well, this year I'm bringing a new game called Watch Ya' Mouth: Throwdown Edition. It one of the must have items on the 2017 Amazon Holiday Toy List and the Top Holiday Toy of 2017 by Toy Insider so I know we're going to have a blast! 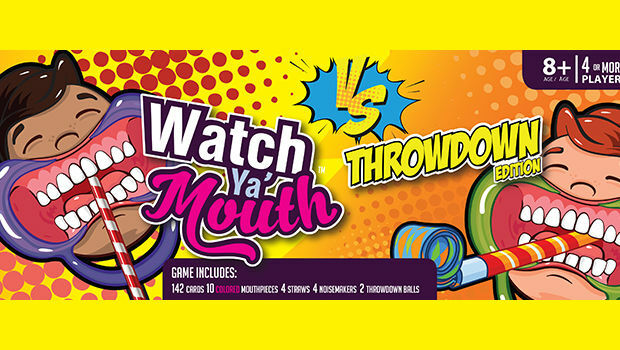 Watch Ya' Mouth: Throwdown Edition is a spinoff of the original Watch Ya' Mouth game. You know the one where you put in those crazy mouth pieces and try to speak the phrase on the card while your teammates guess? Not exactly easy, but definitely tears-in-your eyes, side-hurts-from-laughing-so-hard funny. Well, Throwdown Edition takes the gameplay up a notch. Instead of just speaking phrases, players now go head-to-head with challenging, yet still hilarious, tasks -- and don't worry, those classic mouthpieces are still in play. Separate the Throwdown Cards and the Phrase Cards into two decks, shuffle each, and place them face down. Each player will take turns competing against another player. 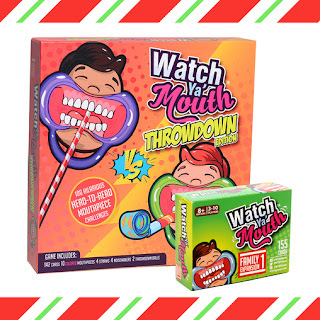 Every throwdown challenge uses a mouthpiece...and yes, you will drool. Determine who goes first, then roll the throwdown die to determine who their opponent will be. For example, the die has markings on it like "person to your left", "person to your right", "choose any player". Draw a throwdown card from the deck, and follow the instructions on the card. It will tell you how to play and if you need to draw a phrase card. Players cannot pass on a throwdown. Both players must place a mouthpiece in their mouths in order to compete. The winner of the throwdown wins that card. If a player needs to choose a teammate for a turn, and wins the throwdown, then only THAT player wins the card - not the teammate. After the throwdown is won by a player, or lost by both, the turn is over. Play moves clockwise to the player on the left and a new turn begins. There are four rounds per game. A round is complete when each player has gone once. The player that has won the most throwdown cards after four rounds wins! If there is a tie, keep playing rounds until one player has more throwdown cards. Want to play this hilarious game too? Use this 15% off coupon code to get one for yourself! They make great gifts too! Use code 15WYM at checkout to get this great deal! 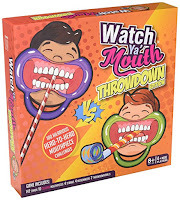 *I was given a copy of Watch Ya' Mouth Throwdown Edition for review purposes. All opinions are my own. When I was little, I wanted to be a mermaid. See, I was a kid when The Little Mermaid came out and Ariel was IT for me. For the next few years, anytime I went swimming with my friends or cousins, we played 'mermaids'. We'd swim around with our legs together and flip our feet like mermaid tails. We thought we were the coolest. I don't think I ever really fell out of love with the fantasy of being a mermaid. I still love The Little Mermaid and I think the current all things mermaid trend is awesome. My absolute favorite thing to come out of the mermaid craze, though? Actual, legit swimmable mermaid tails. I mean, if these were around when I was a kid I would have never gotten out of the water. Sun Tails started as a Kickstarter in 2015, gaining the funding needed in just one month! Business quickly gained momentum & now they're helping people achieve their mermaid dreams all over the world! Ultimately, though, I decided to go classic, and for me, that means green like Ariel's tail from The Little Mermaid. The color I chose is called Siren Green. The mermaid tails are so cool! As you can see in the photo, the tail is made of two parts - the monofin & the skin. You can buy the monofin and the tail separately but the best price available is when they're bought as a set. The monofin is basically one big flipper. It's purpose is to aid in propulsion through the water, but it also holds your feet snugly in place and keeps them from sliding around. Your feet are separated in the fin and rest on cushions so the flipper itself is quite comfortable. It's made of a specially engineered, super durable plastic & is designed to look like it has realistic fish-tail ridges. 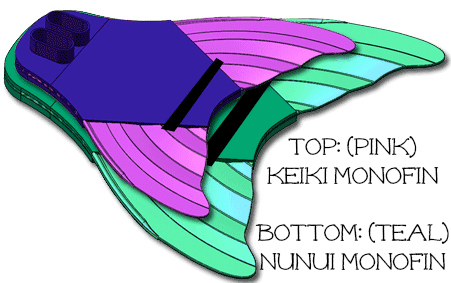 The Keiki, measuring 18" long & 18.5" at the widest part, is recommended for the 6-12 age range and will fit up to a US women's size 7 foot. The Nunui, measuring 21" long & 24" at the widest part, is for teens and adults and will fit up to a US men's size 13+ foot. The skin is what you slip on in addition to the monofin to complete your mermaid look. They're made of an 80/20 spandex material that features a 4-way stretch. The detailing on the mermaid skin is quite impressive. The scales are quite intricate, with a special blend of colors for each tail. You may be wondering how it all comes together. The skin goes on first and then you put the monofin on and pull the skin over it through the opening at the bottom of the tail. While the tails are snug fitting, they are fully walkable, once you've removed your monofin, that is. Want to go further into mermaid madness? Complete your look with a mermaid bikini to match your tail! Sun Tails even thought about the littlest mermaids out there and created Toddler Tails! (How cute is that name?) Toddler Tails fit more like a skirt and are easy to walk in. The fit is looser and a bit shorter too. Sun Tails isn't mermaid exclusive, though. They also sell shark fins! Worn on the back, the shark fins give your free movement of your arms and body. Add a monofin to complete the shark feel! While the shark fins only come in one size, they do fit ages three to adult. SwimFin shark fins also provide buoyancy and can function as a great floating device for kids learning to swim, or just as something fun to wear for anyone wanting to play shark. It complies with international safety standards as well. It's inventor, Kevin Moseley, is 6'3" and over 200lbs, and it keeps him afloat! Want a mermaid tail or a shark fin of your own? Perhaps this would be a perfect gift for a friend of family member this holiday season? 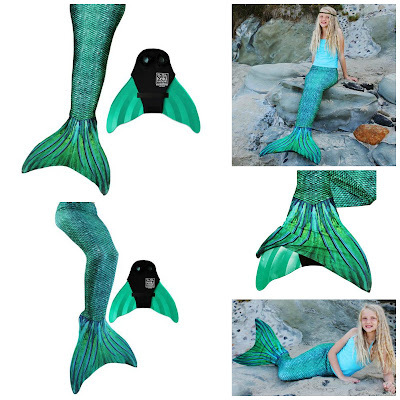 Take 10% off your order at Sun Tail Mermaid by using code BestGiftEver at checkout! *I received a Siren Green Mermaid Tail & Monofin in exchange for this review. All opinions are my own. BLACK FRIDAY DEAL ALERT! KitchenAid 5-Quart Stand Mixers! Y'ALL. I loooooooooove my KitchenAid blender but damn was it expensive. When I saw that they were on sale for literally half what I paid for mine I had to share the news. Macy's has the KitchenAid 5 Quart Stand Mixer w/ Glass Bowl & Flex Edge Beater on sale for $179.99! Choose from Cobalt Blue, Metallic Chrome or Empire Red. They're normally $349.99! This KitchenAid 5-qt. stand mixer is a workhorse that looks great on your counter. It's built with the quality you would expect from KitchenAid, packing 300 watts of power that generates the strength to mix cookie dough or the speed for whip meringue. Model #KSM105GBC. The sale ends on 11/25/17 so get them at this amazing price while you can!